Here we go again: Actual eye candy. 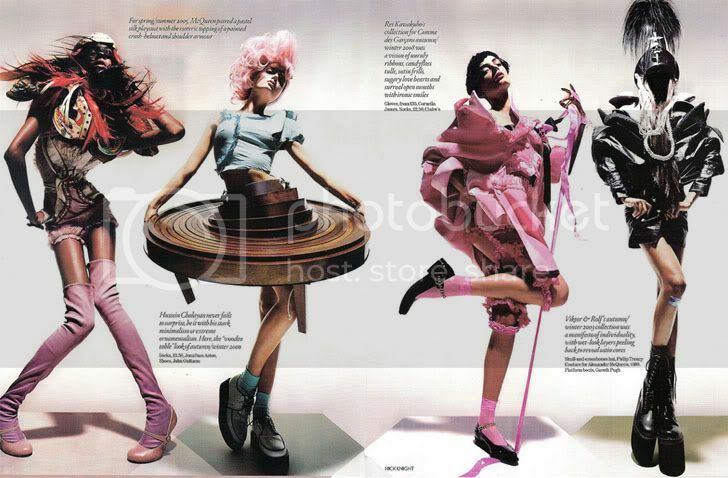 Whilst looking for inspiration for my textiles design, I came across these magnificent garments in a December 2008 Vogue, I'd actually forgotten about. The garments made me realize that this is exactly the kind of thing I want to do for my Japanese street style inspired textiles design and final garment. Since the start of thinking up designs for my finished garment, I always wanted to incorporate art and textiles as these are the two subjects I have always wanted to do best in. So therefore they have kind of made me realize almost exactly what I want to design and make now.